The Manor Farm House, Edwinstowe. One of the few picturesque buildings in Edwinstone is the house attached to the Manor Farm, which adjoins the churchyard on the south side. Until about ten years ago there flourished in front of it a fine cedar-tree. 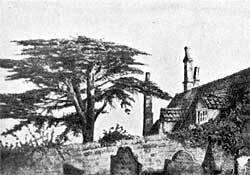 When the cedar died, and a change had to be made, it was feared that this interesting house might be superseded by some more ordinary piece of architecture, as it was inconveniently constructed, and without that attention to the laws of health which is now thought requisite. But the difficulty has been well overcome by the erection of the upper rooms of the house in half timber. All that is now wanting to make this farmhouse one of the prettiest on the estate is the presence of a worthy successor to the fine cedar, to relieve its somewhat bald appearance. A number of the stately firs at the northern extremity of the village were, some years ago, destroyed by the rough winds, but it would be difficult to find a more beautiful spot for outdoor enjoyment than that which stands in the shade of the tall pines yet remaining. Bordered on the gently rising ground towards the north with gorse and heather, and the grand old oaks of the forest, it is an ideal village green. What a charm there is in being abroad in the meadows near the forest in the very early hours of a summer morning, when the grass is newly cut, and the dewy air is laden with its fragrance, and with the scent of the honeysuckle and the wild rose. A mysterious dimness is over the whole landscape; there are no signs of life in the village; all nature seems at rest, save that afar off may be heard the cry of the plover. There is a feeling of repose, a heavenly sweetness in the scene; the very air scarcely seems to be of this gross world; and the delicious half-melancholy silence cannot be compared to anything so well as to soft music, for both inspire a longing for something higher, nobler, better. How solemn is the sound of the old church clock striking the hour—of that old church which for centuries has kept guard over the forest; how long the vibrations dwell in the still night air, and how intense is the silence when that sound has ceased. One cannot refrain from lingering to enjoy the perfect quiet, and to ponder on the many changes that have occurred on every side, and yet have left this beautiful old forest comparatively the same as it was seven hundred years ago. Then the dweller in this village, though he would not dare to be abroad at such an hour as this, yet, perhaps through the chinks of his hovel, he might hear as it travelled up the valley from Clipston, the faint sound of another bell, when prayers were being said in the chapel of the palace there, as ordered by King John for the repose of the soul of his father. Now there is a slight stir in the branches overhead, and a few faint notes from a half-awakened thrush, which are answered from a neighbouring tree. In the east is seen a faint light of dawn, while, near our resting place the lark rises from his nest in the grass, and ascending towards heaven sings a glad hymn of welcome to the new day; nor is it long before the air is full of sweet melody, and turning towards home, the only sad thought is inspired by the cuckoo, for by the note we are reminded that its stay here is nearly over, and the sweet summer will, all too soon, come to an end. About sixty years ago, a writer, describing Edwinstowe, says: "In this village the very houses still remain where the king's huntsman trained up the hounds which years ago chased the sleek deer in Birkland hays. They are now converted into a couple of cottages, the dormer windows peep out of their low roofs, and lilies, marigolds, and wall-flowers bloom within the two-yard-wide gardens in front of them; and apricots ripen on the old grey walls. Only one generation has passed since the last huntsman was consigned to his tenement of clay upon the hill hard by. "1 The road leading to these cottages is still called "Dog Kennel Lane." The village postmaster, however, could not be said to have inherited the poetic genius of the family; indeed, he gave one the impression of being almost anything rather than a poet. It was the delight of the younger generation in the village to have business at his shop of an evening when the mail-bags were being made up, and all was hurry and bustle, to listen to his caustic remarks. Nearer the river Maune than the situation of the present Edwinstowe House, in a building that has since been taken down, there resided in 1784, and for a number of years afterwards, William Boothby, Esquire, the younger brother of Sir Brooke Boothby4 of Ashbourne Hall, who married Rafela, daughter of Don Miguel del Gado, of Mahon, in the Island of Minorca. On the death of Sir Brooke he succeeded to the baronetcy in January, 1824, and died at Edwinstowe on the 17th of March following. Sir William was for many years Major of the Mansfield troop of Yeomanry cavalry. He was succeeded in the baronetcy by his eldest "son, also named William, who married first in January, 1805, Fanny, daughter of John Jenkinson, Esquire, and niece to Charles, first Earl of Liverpool. By that lady, who died in 1838, he had issue two sons and four daughters. Sir William married secondly, in 1844, Mrs. Cranston Nisbett, the celebrated actress. He died at Ashbourne Hall on April 24th, aged sixty-four. On the 12th of April, 1847, Lady Boothby reappeared at the Haymarket Theatre as Constance in The Love Chase. She died January 16, 1858. Crossing the bridge over the river Maun, a little to the right is the house where formerly resided Christopher Thomson, a man of talent, who gave an example of the good that may be done in a humble way, by unselfish devotion to the interests of others. He was born at Hull within a few days of the end of the eighteenth century; and gained the rudiments of education in the Free School of Sculcoates, which he afterwards carried forward by his own determined efforts. In his early days he passed through many phases of life, by turns working in a brick-field, apprenticed to a shipwright, making a voyage as carpenter's mate in a Greenland whaler, and employed as a sawyer at Hull and York. From his youth he had a taste for painting, and some of his landscapes show more than average ability. He settled at Edwinstowe, about 1830, as a house-painter, which business he successfully carried on. In his autobiography he says: " It was my privilege, soon after settling in this village, to make the two or three thinking men—the men who were anxiously looking for better days—my companions; and thus early we pledged ourselves mutually to endeavour to banish crime from the village, and, if possible, to restore it to virtue and freedom. From that time we have diligently worked together, full of hope that somebody would be benefited from our love-labour." By dint of indomitable exertions, and at great sacrifice to himself, he, with the aid of his friends, established a valuable artisans' library, with lectures on popular subjects in the village; and he also commenced a sick-club in connection with a lodge of Oddfellows. All these were successful and beneficial to the people while he resided there. A casual visitor to the country is apt to compare the position of a workman in these beautiful districts, who occupies a comfortable cottage and garden, with its sweet flowers, to the life led by the artisan whose home is in a grimy alley of one of our manufacturing towns, and the contrast is unfavourable to the town dweller; if he be a skilled workman, a carpenter, or a mason, reasonably so; but the wages of the lower class of farm labourers are so scanty that their lives are one long struggle with poverty. They make early marriages ; some will say this is improvident, perhaps it is so; at any rate we cannot wonder, for youth is hopeful; but after that step is taken, with the majority there is no chance of providing for old age, and if the men are of thinking habits they cannot but foresee the inevitable end, should life be prolonged: dependence on others. Such a one was the old stone-breaker, who, with his barrow, and his cheery "good morning," was well-known to visitors to Edwinstowe twenty years ago. Brought up as a farm labourer, he followed the usual course, married; had to maintain a large family, with the result that the utmost he could do was to keep clear from debt. He was thoroughly respectable, and his wife, who was intelligent and careful, had one of the cleanest houses in the parish. When age came upon him, he lost his employment on the farm ; his own children were unable to help him, and he became the parish stone-breaker. Lame, deaf, and half blind, he was at the time of his death obliged to be dependent on the parish; a catastrophe he had always held in dread, but which his best efforts were unable to ward off; and this is an outline of one of the best specimens of his class. One cannot wonder that the younger generation should deserf the country for a place, where, if their surroundings are less pleasant, they may receive sufficient wages to be able to lay by something for old age. These remarks do not apply to labourers on the large landed estates; they are seldom allowed to want. 1 Thomson's Autobiography of an Artisan. 2 Dr. Westland Marston was one of the leading dramatists of the nineteenth century, one of whose first dramas, The Patrician's Daughter, was brought out by Macready in 1842, with a prologue by Charles Dickens; followed in 1849 by an historical play, Strathmore, which met with great success. In 1858, A Hard Struggle drew tears and enthusiastic praise from Dickens. From 1860 to 1874 Dr. Marston's house was a favourite meeting place for poets, actors, and literary men, enlinking the days of Macready, Phelps, Robert Browning, Dante Rossetti, with those of poets and artistes like Swinburne, Morris, and Irving. "He brought her, unconscious of his rank, to 'Burleigh House by Stamford Town.' The 'three fair children' were Brownlow, second Marquis of Exeter, Lord Thomas Cecil, and Lady Sophia Cecil, who, by her marriage with the late Right Hon. Henry Manvers Pierrepont, became the mother of Lady Charles Wellesley. The present Duke of Wellington, therefore, is great-grandson of Sarah Hoggins." 4 Sir Brooke Boothby, of Ashbourne Hall, is still remembered in connection with Penelope (his only child), who, although she died before attaining her sixth year, became famous as the subject of one of the most charming of Sir Joshua's studies of infantine grace; of the most successful effort of Banks, the sculptor, to perpetuate her memory in Ashbourne, and a splendidly illustrated volume of poems by her father, entitled Sorrows sacred to Penelope. 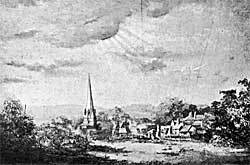 This figure by Banks is said by Ebenezer Rhodes, the friend of Chantrey, to have suggested to Sir Francis the sleeping children in Lichfield Cathedral.